FancyGantz: How do I budget? I've found that the easiest thing for me right now is to use good old paper and pencil! I have a spiral notebook that has become my financial diary. I have a lot of figures in it - total debt, income, lists of bills that are due from paycheck to paycheck and so forth. I don't keep a traditional check register anymore. Since Dave teaches us to use a "Zero-based Budget" I don't see a need to keep a running check register. Instead, before each of Aaron's paychecks, I start a new sheet in my spiral notebook for that period's checking account transactions. The first line is our starting balance which is always $0 because every penny is sent to the debt snowball after bills are paid. The next line, I add Aaron's paycheck amount and the next is our cash out line. (We pull cash for everything we can to limit debit card transactions.) I then start listing the bills that are due (by date). After that, whatever is left goes to the debt snowball. I typically leave about $4-$5 for the first week just in case I've made a math error. Once I'm certain that I haven't - typically by the next week - I transfer those few dollars over to the credit card. 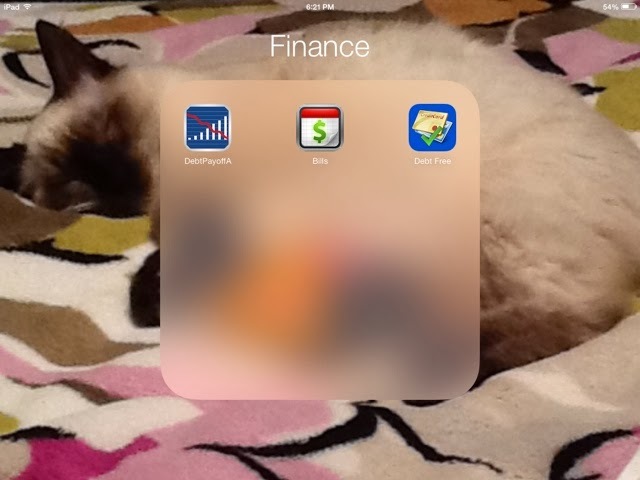 Here's a screenshot of the three budgeting apps I'm currently using. I believe the one on the far left was one that I paid around a dollar for because the lite (free) version was limited to just one or two accounts.